Pictures of our FM / DAB aerial test rig. On the left we have a diagonally polarised FM half wave dipole and on the right a deliberately mis-installed 3 element DAB antenna. This bodge knocked about 3dB off the forward gain, which is what one would expect. Incidentally when the aerial was mounted at the top of the pole (i.e. only half of the mast is between the elements) approximately 1dB was lost (link), also see polarity of obstructions. Note the cabling is just "draped" and we have utilised an L section “loft kit” because the installation is only temporary. We would not normally recommend using a loft kit for an aerial outside. Having said that the windloading on an FM or DAB dipole is pretty low and, in fact, the mounting boom of a Half Wave FM is 1" so, if required, will fit straight into a two way surface bracket. All performance measures are relative to the (directional) gain of a 3 element FM or DAB aerial ( = EXCELLENT). 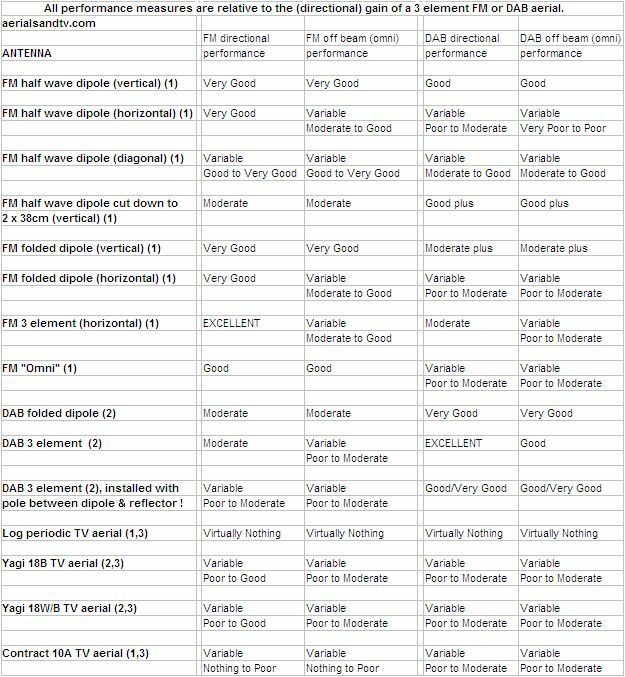 For a table of the approximate dB readings for these tests click here, and also see aerial report for FM Half Wave Dipole v Omni. do you really need one ! ? It doesn`t take much study of the results table to discover that if you want FM and DAB (from one aerial) the best all round antenna is the Half Wave FM open dipole, preferably installed vertically so it will work omni directionally and will also pick up DAB pretty well too. FM gain is about 0dBd. The vast majority of sites in this country will get a perfectly acceptable FM signal with one of these aerials, and the great majority a decent DAB signal as well. The model we sell will mount both horizontally and vertically, but it is also possible to use it diagonally. If you are struggling with a particular frequency then utilising the latter polarity may help bring it in, it`s rare but at least it`s another option. On the other hand horizontally it has a bit of a null off each end (and thus a bit of directivity) so this may be useful to decrease a bit of interference if required. It is also quite acceptable (and easy) to shorten the elements in order to improve the DAB (at the expense of FM) if you decide in the future that DAB is more important to you. I`m not an expert in antenna design but we cut down the elements from 75cm to 38cm and DAB performance improved to just behind that of a DAB dipole, though the FM dropped off markedly. Being a half wave dipole it naturally has a 75Ω impedance, i.e. matched to the cable and (most) receivers for maximum signal transfer. Thus an open dipole should not have a balun, if it does there`s something wrong somewhere ! Some crude tests at home indicated that a Half Wave dipole was giving about 5 to 10dB more (depending on frequency) than one of those single wire setback aerials that some small radios are supplied with. So it is entirely possible that putting a Half Wave Dipole in your room (as opposed to outside or in the loft where it will undoubtedly work much better) may be sufficient to improve your signal over the supplied setback aerial, make sure your radio has an external aerial socket though ! Our half wave dipole is supplied with either a 2” rotating clamp or with two way surface bracket, though it should be noted that this aerial will work best when its full height is exposed to the direction of the transmitter. If mounting in a loft try to ensure the direction of the TX is through the roof rather than any end wall. Incidentally moving the aerial around its mounting pole can make a difference to the received signal, and not just where the pole is in front of, or behind, the aerial`s alignment onto the transmitter. I was surprised to discover this and suspect it may to be reflected RF waves off the roof. Lastly, if the aerial is polarised vertically, some people have found a difference in signal depending which of the elements the cable`s centre core is attached to. Also see wiring up an FM dipole. See aerial reports for the Half Wave Dipole, particularly this report. 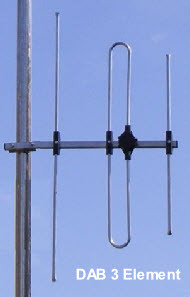 For a higher FM signal, and increased chance of rejecting unwanted signals, go for a three element FM aerial though unfortunately they are significantly bigger than the dipoles which could be important in exposed locations. Furthermore the size / wind loading of multi element FM antennas can be problematic and they are not of the strongest construction either, particularly the directors and reflector. Lastly it is not generally practical to mount them vertically, though this is a bit irrelevant anyway because if fitting a multi element aerial then directivity is the whole point of the exercise *. It should be remembered that whilst the 3dBd gain that a 3 element aerial gives you is certainly worthwhile in weak signal areas, it is the aerials` directivity (i.e. its rejection of unwanted transmissions) that is possibly more worthwhile. These`s no escaping the fact that a 3 element antenna (particularly if it`s horizontally polarised * ) will give you a more reliable and consistent signal than any omni directional aerial. However directivity will obviously be a problem if you want to pickup more than one transmitter, and the vast majority of people don`t need a multi element FM (or DAB) aerial anyway. If you`re unsure whether to go for an FM dipole or an FM 3 element, bear in mind that you can convert a 3 element to a Dipole by simply removing the director and the reflector ! * A vertically polarised aerial will be more susceptible to picking up off beam transmissions because to those broadcasts from the sides the antenna is effectively a vertical dipole. Or, put more simply, the aerial will be more directional if installed horizontally polarised. Obviously if you want the most DAB signal, and are not that bothered about FM, then go for the DAB dipole because it does give more DAB response than the half wave FM dipole. DAB gain is about 0dBd. 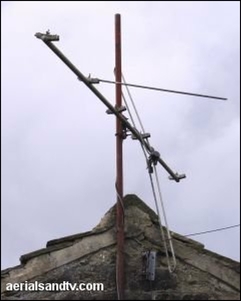 The vast majority of sites in this country (which are within a DAB transmission area) will get a perfectly acceptable DAB signal from one of these aerials, particularly if it`s on the roof or (slightly less so) in a loft. That said, the great majority of sites will get a perfectly acceptable DAB signal off an FM Half Wave dipole and fitting the latter would give very good FM reception as well. On the other hand it was apparent that the DAB dipole was not that good for FM, far worse than you`d expect. The explanation for this became clear in Autumn 2008 when we changed the model of FM folded dipole which we stocked. 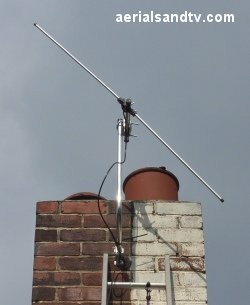 The previous model of the FM folded aerial had a balun and its DAB response was poor, whereas the new model has no balun and its DAB response was much improved. Our DAB dipole has a balun and it is this which primarily cuts down the FM. One assumes that if a DAB dipole has no balun its FM performance would be significantly better, though it would obviously still be inferior to an FM dipole. However, the lack of balun may well mean its DAB performance would suffer a little bit. 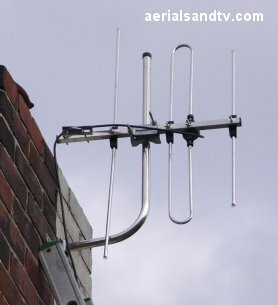 If you`re really short of signal then you could consider a 3 element DAB aerial. Bear in mind that DAB is supposed to be a “single frequency network” (for the main stations anyway) so an omni dipole which can pick up a signal from the strongest available transmitter is preferable [but only if there is sufficient signal strength for their use], a directional aerial will obvioulsy make that more problematic. The 3 element model is directional but does have about 3 dBd of gain. If you`re unsure whether to go for a DAB dipole or a DAB 3 element, bear in mind that you can convert a 3 element to a dipole [which is omni directional] by simply removing the director and the reflector ! Thus the DAB 3 (an aerial which can be converted from a higher gain directional to a lower gain omni) is a good choice if you are unsure of the signal strength in your area. If the correct aerial is used then it will work pretty well for both FM and DAB if installed vertically polarised, also see article on FM aerial polarity. Due to the lower frequencies involved “line of sight” (to the transmitter) is less important than with TV transmission. Similarly installing an aerial in the loft for VHF is not usually so deleterious to the signal as it is for UHF. That said, any aerial will work significantly better without a roof between itself and the transmitter, it`s just that the difference becomes more marked as the frequency rises, higher frequencies (e.g. TV) being much more attenuated than lower frequencies (e.g. FM). Although I am not an expert in the field of MW/LW (AM) broadcasting I`m told that aerials should consist of a length of wire as long as possible, but remember that the wavelengths are quite large ! Try stringing the wire out in your loft but bear in mind that these bands will suffer interference from the continent during hours of darkness and a more efficient aerial may well just bring in more of this co-channel. Generally speaking a MW aerial is aimed at getting the antenna up away from noise, not just to increase the amplitude of the received signal. Radio broadcasting is subject to the same polarity criteria as TV transmission, although the Cross Polar Rejection is much less significant than it is for higher frequency television signals. Most FM is transmitted in vertical (or mixed) polarity and all DAB transmissions are vertically polarised See article on this subject. It should be noted that FM folded dipoles (sometimes - incorrectly ? - known as Full Wave dipoles) theoretically should have a bigger increase in gain over a half wave type than we found in our tests. In fact, there wasn`t much difference between this aerial and the FM Half Wave dipole and this is probably due to the lack of a balun in this model of aerial. A folded dipole has a 300Ω impedance whereas most cable and tuners are 75Ω, one can speculate that the increased signal from the folded dipole is to some extent lost by this mismatch, the previous (no longer available) model had a balun and about 2dB more gain on average. At some frequencies the folded dipole is a bit in front of the half wave but at some others it`s a bit behind. However, where the Folded dipole really scores is that it has probably the strongest construction of any FM aerial since it has none of the relatively weak FM directors and the dipole (being a loop) is obviously much stronger than an open half wave type. So if you live in a particularly exposed location, or you suffer from ample avians, this is the aerial for you, if not then I`d fit the Half Wave dipole. The aerial is essentially omni-directional if installed vertically polarised and slightly directional if installed horizontally. It was apparent that the folded dipole antenna did not pick up DAB as well as the half wave, though it was still better than the “Omni” and far better than a TV aerial, i.e. it`d work OK for DAB in a moderate signal area. Note that we do not pretend that these are scientifically accurate tests (our TV aerials tests are more rigorous) but they do reflect the relative performance of the various antennas. And finally a shorted out test cable. Incidentally these tests involved a large amount of work as the signal varied from day to day and even from hour to hour. This helped to explain the inconsistent results we`ve had in the past but it also meant that we had to keep repeating the tests in order to get meaningful results. See below the results table for accompanying notes. Cable for FM / DAB should be 75 Ohm Co-Ax and although the lower frequencies make cable quality less critical than for TV reception it`s still worth using decent stuff ! Finally remember that it is possible to Diplex FM/DAB signals onto TV downleads or into a TV distribution system. Some sources say that for FM you should be aiming for a signal level between 60 and 75dBμV at the tuner input but most tuners will work fine down to 40dBμV (some even lower) and that includes the additional signal [15dB or so] that stereo decoders require. Arguably a more realistic ideal about 50 to 55dBμV. For DAB the quoted ideal is 40dBμV to 70dBμV but again many tuners will work perfectly well on less than this, say down to 35dBμV. Aim for 55dBμV ? Whilst testing FM and DAB aerials on our back wall, not, it should be noted, up on the chimney, we were getting FM figures of 45 to 50dBμVs and DAB at 35 to 40dBμVs and the tuners were working fine. The FM half wave dipole on my roof gives mid/high 50s dBμV on both FM & DAB, interestingly it didn`t give much less in the loft. I also have a little FM/DAB radio in our kitchen which operates off its own poxy little aerial, the FM is probably in the mid 30s dBμV for FM and DAB yet it still works OK, though the FM may not be in stereo, I wouldn`t know because the speakers are only 2” apart. Incidentally, what is the point of having two speakers only 2” apart ! What all this means is that in the real world so long as you`re getting a decent quality signal from a dedicated FM aerial, you can split it quite a few times and, nearly always, it`ll still work fine. Here are all the commonly available DAB and VHF/FM aerials amounted on one pole. I cannot take credit for this particular brainwave because it was Pat (one of the aerial installers) who came up the idea. The exercise is particularly worthwhile to appreciate the difference in size between the various antennas and the potential for mounting them using different polarities. 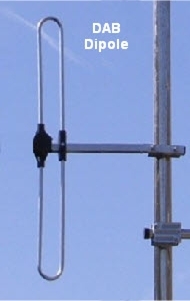 A picture of a diagonally mounted FM dipole is displayed below and this polarity (along with vertical and horizontal) is possible with the model we sell. The FM half wave and folded dipoles are both 59” (1.5m) high, or 59” wide if horizontally polarised ! The 3 element FM is 59” (1.5m) wide by 34” (86cm) long. The DAB dipole is 24” (61cm) high. External aerial input, have you got one ? ! ? The 50Ω / 75Ω mismatch problem…..
FM aerials : horizontal or vertical polarity ? Which direction should I point my FM or DAB aerial ? Separate DAB & FM inputs on your tuner ? Why does my signal improve (or deteriorate) at night ? On the subject of FM polarisations it is possible to change polarity fairly quickly, and this occurred when a fire in 2004 caused the Peterborough radio transmitter to fall down ! 1 Your aerial is a Half Wave dipole (they`re not as strong as the folded dipole). 2 Your car is a dark colour and parked underneath said horizontally polarised aerial. I would add here that the above applies more for omnidirectional aerials, and less so for multi element directional FM antennas. The following is an extract from and article by Mike at Choice FM which seems to make sense. Make your own mind up ! Polarisation Horizontal or Vertical ? A topic which still causes lot of confusion when discussing aerials is polarisation whether aerials should be mounted horizontally or vertically. In the early days (1950s) of FM radio it was found that when the signal was transmitted with horizontal polarisation it seemed to be much less severely affected by vehicle ignition interference. Those were the days when there were very few portable, or in-car, receivers so nobody ever bothered dealing with the problem of ignition interference at source. However by the 1970s, with transistors having almost completely replaced valves and radios appearing in cars, vehicle manufacturers started paying attention to the problem of engine interference (no point having a car radio if all you can hear is the noise off the spark plugs) and most radio listening was now being done on portable radios with small telescopic aerials which 'pointed up the way' (i.e. vertically). Suddenly horizontal polarisation didn’t make much sense anymore and broadcasters started reverting to either mixed (horizontal and vertical), or pure vertically polarised signals. 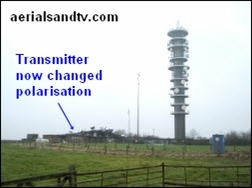 Nevertheless, old habits die hard and many aerial installers and even manufacturers still insist that FM aerials should be mounted horizontally, the fact that most (but not all....) TV transmitters [main transmitters that is, not repeaters] use horizontal polarisation probably adds to the confusion. In a very small number of cases (where a station one wants to hear is using mixed polarisation and there is interference from one using vertical polarisation) it makes sense to use a horizontally mounted aerial but, 99% of the time, aerials should be mounted vertically. Above left we have Pontop Pike`s mixed polarity FM transmitting array, this transmits at 134kW. 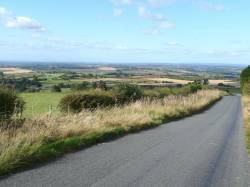 Above right is Acklam Wold (just south of Malton in Yorkshire) which transmits vertically polarised at 2kW, the two vertical transmitting antennas are clearly discernible. Acklam Wold, Transmitter, View and The Stoat (or why it`s better to walk than drive....). How often do you see a Stoat ? How often do you get a chance to take pictures of it ? Especially a photo when the Stoat is up close and looking straight at you ! Who says that visiting transmitters is boring ! FM Horizontal Or Vertical Polarisation ? There is an article reprinted below which goes into the whys and wherefores of FM polarity and I agree with it generally speaking, consider this section a preamble to it. 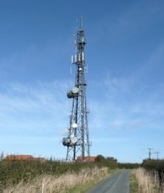 As regards BBC FM network (national stations : England, Scotland, Wales, NI and Local stations) all the main transmitters are mixed polarity like Pontop Pike in the picture below left. 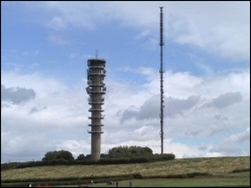 Most of the relay transmitters are vertical polarity like Acklam Wold in the picture below right. This transmitter actually broadcasts BBC Radio York (rather than the BBC National FM stations) but it`s a clear well lit photograph which shows up the transmitting arrays well ! When I last checked, of the 114 BBC National FM transmitters 49 were mixed polarity, this is 43% of the total, but this accounts for far more than 43% of the audience because this figure includes all the high power main transmitters. Of the others, 63 were vertical polarity, which is 55%. Only 2 were horizontal polarity, and both of the latter were small transmitters (20W & 30W). As for the Commercial FM stations a scan of the Ofcom database for all radio stations in the UK reveals only one which is (just) horizontal polarity. 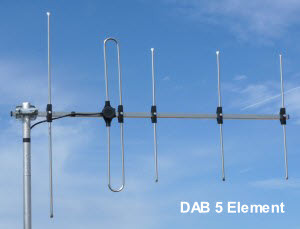 For people who want as much DAB signal as possible (and most people don`t need a high gain DAB aerial) in Sept 2012 we started stocking a 5 element DAB aerial. I would estimate that the 5 element DAB aerial would give about 2dB more gain than a 3 element, i.e. about 5dBd. Note : In the case of this aerial we would recommend end mounting it because mid mounting would put the pole between the (vertically polarised) elements thus negatively affecting the gain. Just out of interest we tested TV aerials for FM and DAB reception and to be frank we were rather surprised that they gave any significant signal at all. To be honest it goes against all theory that they seem to pick up as well as they do. Maybe the boom of the antenna is acting as an aerial, but the bottom line is that if you get a decent FM (or DAB) signal off a TV aerial it is probably because you are in a strong signal area anyway. Installing more than one aerial on a pole (e.g. TV plus FM) ? see article on this subject. Historically radio in the UK was always broadcast in three distinct bands, from Long Wave through Medium Wave up to VHF/FM (Very High Frequency), but in 1995 a new digital system was introduced just above the FM band. 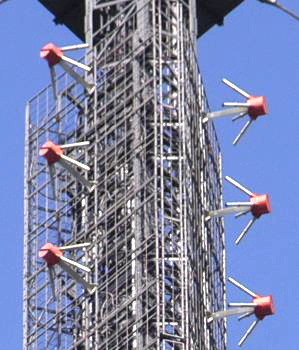 This was christened Digital Audio Broadcasting, or DAB, and, unlike FM, it is transmitted on a Single Frequency Network. Also, unlike FM, packages of stations are transmitted together (a bit like the Freeview MUXES). These were originally called ensembles but often now referred to, somewhat confusingly, as MUXES. In fact it is important not to get DAB confused with the radio channels which are transmitted as part of the Freeview package, that is a different system altogether. Some of the FM aficionados who buy aerials from us assure me that FM has a superior sound quality to DAB. Personally speaking I only tend to listen to Radio 4 and Radio 5 so I cannot really confirm this ! But if DAB follows the same pattern as the picture on Digital TV then this rumoured superiority of FM wouldn`t surprise me at all. That said, just like with Freeview TV, this supremacy of the analogue system would only apply if you have a decent signal. Those who have an imperfect signal, and/or a low quality system, would probably find DAB superior. There is one seldom mentioned advantage of the DAB system. I`m told that down in London, and some other big cities, there are so many pirate stations around that getting interference free FM reception can be a little frustrating, but, at the moment, the pirates haven`t cracked DAB. Some cynics reckon that the powers that be are slow timing on prosecuting the pirates to try and force people to switch to FM ! The story was that in June 2009 the Government published its "Digital Britain" report in which it said it would like to switch off all national analogue radio in 2015, but even then they were only talking national FM transmissions anyway (e.g. BBC Radio 1 to 4 and Classic FM), not local ones, and local included the BBC local radio stations. So don`t go thinking FM broadcasting was ever going to end anytime soon ! (reconfirmed by Ofcom Aug 2012). There have never been any plans to cease local radio FM transmissions. The latest twist was in December 2013, the Government abandoned any timetable to switch off analogue radio, which may not come as much of a surprise to some people. Those cynics doubted the FM signal would ever be turned off because low band VHF isn`t that suitable for mobile Internet (unlike UHF), so it`s not so worthwhile for the Government who are primarily concerned how much money it`d raise, particularly as the spectrum doesn`t seem to be worth as much these days ! Here`s an interesting resume of the latest (Aug 17) on the possible FM switch off. However the fact that radio switchover may possibly happen at some indeterminate time in the future does mean that the FM half wave dipole aerial`s relatively good performance on DAB (and the fact it can be easily cut down to improve DAB still further) is yet another point in its favour ! 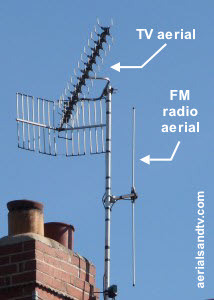 Which direction should I point my FM (or DAB) aerial ? 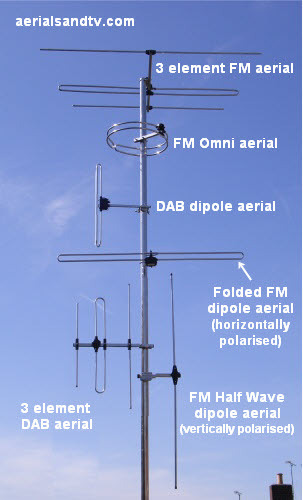 An interesting question, but also an irrelevant one for most people because the great majority of FM and DAB aerials in use in this country are (theoretically) omni-directional, the most common examples being the excellent FM half wave dipole and its cousin the FM folded dipole. They`re both essentially omni-directional if installed vertically polarised (they`re slightly directional if installed horizontally polarised). The other common omni-directional FM aerial is the Halo type Omni, actually they`re probably more common than dipoles, despite the fact they`re a bit crap…… By far the most common DAB aerial is the DAB dipole, which is the DAB equivalent to the FM folded dipole. As you would expect from its name an omni- directional aerial theoretically picks up signals from all directions equally. However, when I say theoretically omni-directional I mean it because even if the aerial were truly omni-directional (it`s dubious that any aerial can be 100% omni-directional) it would only be so if it were installed many feet above any roof and mounted on a non conducting pole….. In the real world the amount of signal a theoretically omni-directional aerial picks up would vary, mainly by the influence of nearby roofs but also the effect of the pole on which it`s mounted (particularly if it`s a vertically polarised dipole). Neither of these factors are reliably predictable - though in actual fact hardly anything in the RF game is totally predictable - so my advice is just experiment if that should prove necessary. But it probably won`t prove necessary anyway ! So, having clarified the above, assuming you`ve got a directional multi element FM or DAB aerial, which direction should you point it ? Well that`s not a simple question because not all the stations, particularly the local radio stations, come from the same transmitters, they often do, but not always ! DAB is a bit less affected by this problem so I`d just locate the most likely DAB transmitter (always remembering that “line of sight” is usually a more important criteria than distance) and align your aerial onto it. If that doesn`t work try one of the others ! Bear in mind that DAB is transmitted as groups of between 5 and 12 stations within an ensemble (sometimes just called a MUX these days), this knowledge will help you understand the apparently complicated frequency finder pdf linked to below. Also remember that DAB is transmitted as a single frequency network, i.e. you may be picking up signals from more than one transmitter even for the same station on the same ensemble/MUX. So, more so for FM, the question then becomes which direction do I need to point my aerial in order to pick up what station ? The answer to these questions can be found on the information on the links below. BBC reception gives a basic prediction for MW, LW, FM, DAB and TV. UK Digital Radio DAB also includes a basic DAB coverage checker. Unfortunately the latter doesn`t appear to tell you where the stations are transmitted from and neither gives their transmission powers. NOTE ! Postcode reception predictors are never more than a guesstimate ! Ofcom`s database of all the MW, FM and DAB transmitters Includes much information, not all of it immediately discernable including the (FM) polarisation in column “O” and “P”, also the radiated power in 10 degree steps (i.e. its radiation pattern). This article does not concern itself with AM radio (MW or LW) because hardly anyone has a directional AM aerial, but this link for all MW stations and the transmitters broadcasting them may prove useful. Separate DAB and FM Inputs on Your Tuner ? Many tuners come with separate inputs for DAB and FM signals which obviously causes a problem if you`ve only got one combined FM/DAB signal. I`ve been onto most of the manufacturers but none make a “setback” FM + DAB diplexer to split out the FM and DAB signals. This leaves you with a number of options. 1 Use a 2 way splitter. This will obviously only supply half the signal to each input but I`d have thought that most FM/DAB signals would cope with this OK. This method doesn`t split the frequencies into the correct bands for each input but this shouldn`t cause a problem. Splitters are available with either Co Ax or F connectors. 2 Use a 2 way amp which includes the FM and DAB frequency range, preferably a variable gain model. As with a splitter this method doesn`t split the frequencies into the correct bands for each input but in most cases that wouldn`t cause a problem. Our 2 way mains amp would be suitable for this. Using an amp to split FM and DAB should be a very rare occurrence, I`d only try it if you`ve already tried a splitter (preferably a diplexer or triplexer) and the latter adversely affected the signal. 3 Use a TV + FM + DAB triplexer, ignoring the TV output if it isn`t required. The one we stock is normally used outdoors but can be removed from its casing to reduce its size. I have to say that from a technical aspect using the FM + DAB outputs from a triplexer is preferable to using a 2 way amp or a splitter, see diplexers v splitters. 4 Install separate FM and DAB aerials and run two cables down to the tuner. This is obviously the most hassle (and cost) but theoretically will give the best results. That said utilising the same two aerials and one downlead, but using two* triplexers, wouldn`t be that far behind ! * One on the aerial mast to combine the signals, and one at the set back to split them out. For further reading on aerials / antennas see Wikipedia & Astrosurf articles. For those who feel they really do need every last dB of signal (and most people don`t) we stock our highest gain FM antenna : the 6 element FM aerial. The aerial is similar to the 3 element version but has 3 more directors and is 6ft 10in long ! 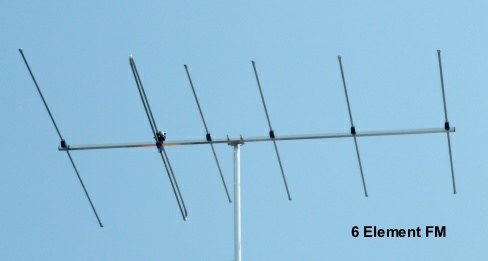 I would estimate that a 6 element FM aerial would give about 5 to 6dBd in gain. For general information on this aerial see FM3 above. A half wave dipole is a much better bet for FM than an Omni and many people find the former is far more effective at minimising “hiss” than the latter. Don`t forget the half wave dipole also works pretty well on DAB, though an Omni (or even a TV aerial ! ) Will still pick up DAB if your signal strength is high enough. Incidentally, the BBC “do not recommend circular aerials for national FM broadcasts”. See aerial report for FM Half Wave Dipole v Omni. 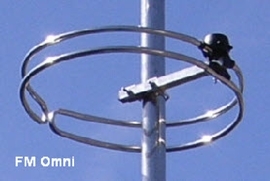 The round FM “Omni” type antennas do not perform as well as the half wave dipole and this reflects their design which gives a theoretical minus 3 dBd gain figure. Even so, if you`re in a strong enough signal area, you will still get reasonable FM from an Omni. However, basically, we think they`re crap so we don`t stock them. In fact I`m at a loss to understand why there are so many Omnis around, but, of course, just because there`s a lot of something around it doesn`t necessarily mean it`s any good. Take chipboard for example. A building material which has negligible physical strength and isn`t even waterproof. It`s absolute crap, yet it`s used bleedin` everywhere. Which begs the question, on what day did The Lord create chipboard ? And would it not have been better if he`d rested on that day ? The 50 Ohm / 75 Ohm impedance mismatch problem….. Occasionally we get a customer reporting his tuner requires an aerial / cable with 50 Ohm (50 Ω ) impedance, these are often two screw on terminals. The problem being that 75Ω cable / aerial will result in an impedance mismatch and for maximum signal this is not really desirable. However, I`m not even sure where one could obtain a 75/50Ω matching transformer and even if you could find one the losses in the windings would to a large extent negate its fitting anyway ! The actual loss from the mismatch is likely to be about 1dB (different sources quote different figures, partly because they`re all quoting different frequencies and transmit or receive etc etc) which in most cases is not significant, even less so for FM and DAB as opposed to TV. We`ve still got the problem of connecting a CoAx cable to two posts, personally I don`t see any other way than this one. Thanks to Bill Wright for help with this article. There is an additional band (Short Wave) between MW and VHF but this has never really been used for public broadcasting in this country. Notice how as the frequency rises the wavelength falls and the latter then requires shorter element(s) on the aerial in order for it to become resonant. This is clearly illustrated in the picture above and that of the amateur radio aerial array. Whilst it is not relevant for the purposes of this article it should be pointed out that both Long Wave and Medium Wave are Amplitude Modulated (AM) whereas the other two are Frequency Modulated hence the term FM. Before investing in an aerial for your radio I`d check it`s actually got an external aerial input connection ! Some of the cheaper radios (FM and/or DAB) can only be used with the supplied "set back" aerial because they lack an external aerial input socket. That said, in some cases (particularly for DAB radios) the supplied aerial unscrews and reveals a female F connector socket onto which a lead from a decent aerial can then be screwed. In March 2017 we finally got round to doing some crude tests seeing what improvement in reception (if any) was obtained by connecting an external aerial`s CoAx cable to a telescopic set back aerial on a radio with no external aerial socket. The first thing I discovered was the external/internal aerial switch on my Panasonic RF-D1 FM/DAB radio didn`t actually seem to do much at all ! Furthermore, somewhat surprisingly, the external aerial socket was only for DAB, not FM ! Anyway, we were a bit surprised to discover that connecting the centre core to the aerial made a significant difference to reception, both for FM and DAB. Whereabouts along the telescopic aerial the cable was connected (via a crocodile clip) seemed to make little difference. I would say that experimentation in this regard may be worthwhile, you could even try removing the aerial and attaching the external aerial`s CoAx centre straight to the mounting stub. NOTE : it was only the centre core which improved reception, connecting the screening braid made no significant difference at all. Also see this aerial report and this Forum thread on this subject. When it comes to aerial input connections, most FM tuners have a male CoAx connector socket, i.e. the aerial input lead requires a female Co-Ax on the end of it (which is the opposite of a TV input). Since there are no decent quality female CoAx connectors around (apart from some right angle types) you will require a decent quality male CoAx plug and a Back to Back CoAx coupler to convert it to a female. Alternatively use a right angle CoAx connector, available in male or female. DAB tuners invariably have an F Connector socket for the aerial input. Of the supplied "set back" radio aerials the worst are the single wire types, though as mentioned frequently on this site, signal strength is almost everything. If you live in a strong signal area even a crappy single wire aerial may well work fine ! "T type" wire aerials work better than the single wire types but a decent FM or DAB aerial will usually out perform a "T Type" even if it`s just propped up against the wall by the side of the radio ( ! ) though any aerial will work better in the loft and better still high up outside. I managed to get hold of a list of the approximate population coverage for all the FM transmitters, and very interesting it is too, certainly to those of us with mildly autistic tendencies. The population coverage figures are (more or less) for the BBC national stations and are about 20 years old, but I wouldn`t have thought they`d have changed that much. Note that the figures are just for the main transmitter, and don`t include coverage of any repeater(s) off it.